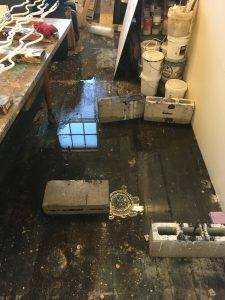 When it comes to your studio, a little uninvited water can wreak a lot of havoc. While recent extreme weather and approaching spring floods have put water on our minds, nature isn’t the only source of damage– a broken pipe, a damaged roof, or water from extinguishing a small fire can have devastating consequences for your artwork. Morgan Sims’ studio after a fire in the building tripped the sprinkler system. 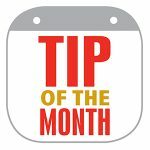 Install “check valves” to prevent floodwater from backing up into the drains of your home and studio, and learn other basement flood prevention tips here. The Studio Protector section of the CERF+ website has a list of Disaster Specific Planning Resources.